Amsterdam, c.1640. Dutch text edition. 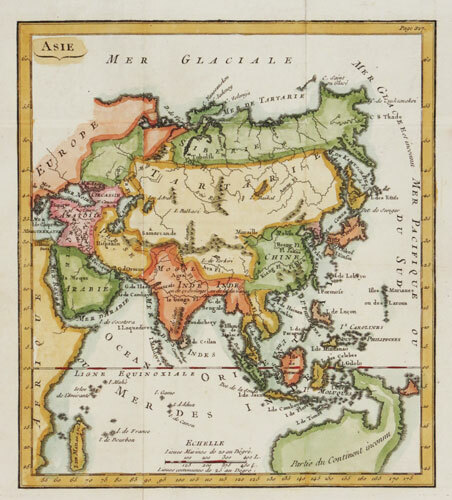 Blaeu's magnificent map of Asia, decorated with nine vignette prospects of cities (including Goa, Jerusalem and Macao) along the top and ten costume vignettes down the sides. Embellishments on the map include a lion, elephant, camel, sea monsters and galleons. London, c.1795. Updated to show Cook's discoveries in Australasia and the northern Pacific. France, 1800. Asia, with a large island of 'Jedso' above Japan. The Cape York Peninsula joins Australia to New Guinea.